Give white fish a lift with tangy lemon, herbs & Parmesan. 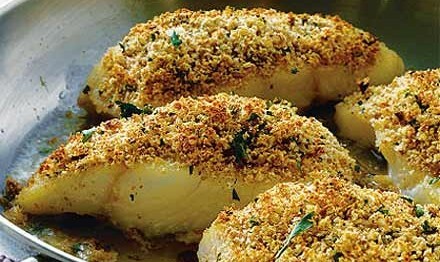 Mix the breadcrumbs with the grated lemon zest, grated Parmesan, chopped parsley, salt and pepper. Season the 4 skinless fish fillets. Pan fry in a little oil for 2-3 minutes until just tender. Turn over and sprinkle with the crumb mixture. Brown in the pan under a hot preheated grill for 2-3 minutes. Add the butter to the pan with the juice of 1 lemon. Melt around the fish and serve.